Some jobs just need an extra boost. That’s why we stock our very own powerful booster to help you with tough stains. Choosing the right carpet cleaning booster, which will give your job a little bit of extra sparkle, can be hard. You don’t want to throw in any old booster and ruin the hard work that you’ve already done. Whyte Specialised Equipment has put our tick of approval on this carpet cleaner booster so you’ll know it will get the job done. 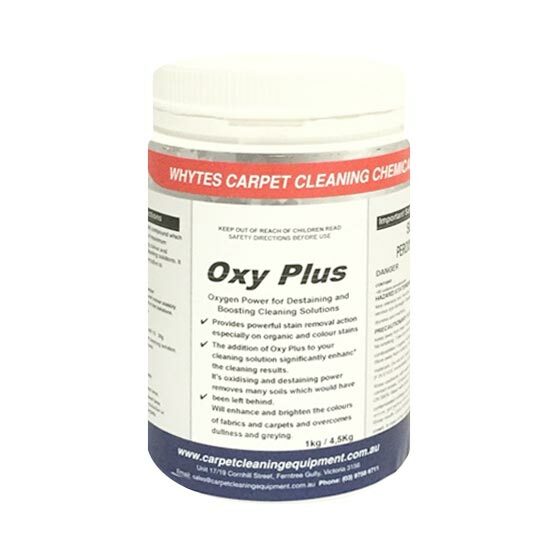 This powerful oxygenated compound delivers a maximum clean by using oxygen to target problem areas. Whether you need to remove stains or boost your cleaning solutions, this product has the added advantage of an alkaline pH, making it the ideal booster for most cleaning solutions. Plus, because we store our booster in powdered form, it has a dramatically longer shelf life than any of the liquid peroxygen products on the market. Based in Ferntree Gully, our carpet cleaning booster to businesses across Melbourne, Canberra, Sydney, Brisbane, Darwin, Perth, Adelaide and Hobart – and across regional Australia.